This Thursday marks the third and final week of the Swansea Public Library Flash Fiction Workshop, but there’s more flash to come. 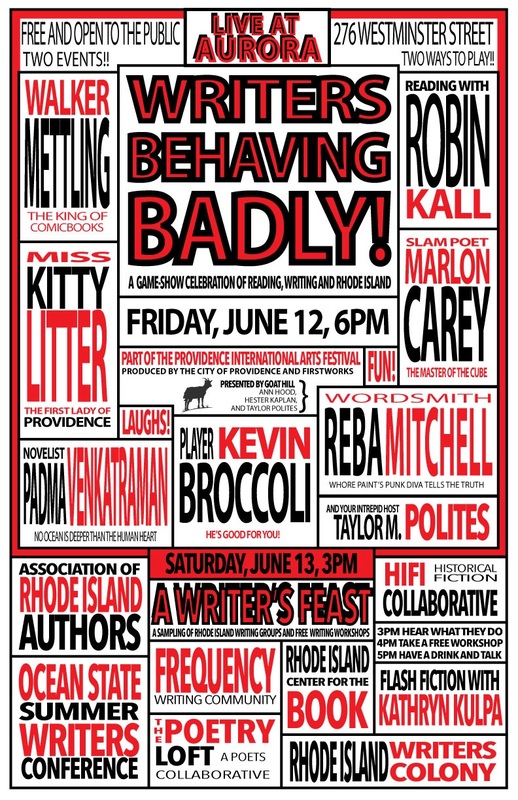 I’ll also be giving a workshop as part of the Providence International Arts Festival in June, teaching a teen writing workshop at the Tiverton Public Library this summer, then returning to the Bristol Public Library in early fall for another workshop. For our final reading, I’d like to share one of my favorite flash pieces: “I Am Holding Your Hand” by Myfanwy Collins, originally published in Monkeybicycle. I had the chance to talk with Myfanwy about her writing process, and we’ll talk about craft, inspiration, and learning to trust yourself when we discuss this story at the next meeting. -Write a story set at Christmas (or Memorial Day, or Fourth of July, or Thanksgiving, or any significant family gathering). You can draw on memories of your own holidays, or even invent a completely fictional holiday. The story should be primarily set in one particular year, but should include at least one flashback or flash-forward set outside that time-frame. Have fun! See you again on Thursday, May 28 at 6:30 p.m.